Pre-heat oven to 400F. 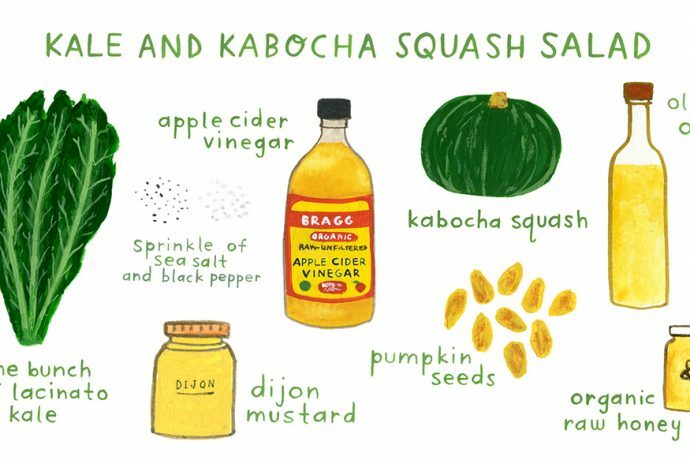 Cut kabocha squash in half. Scoop out seeds and discard. On a foiled baking sheet, roast cut side down for 20-25 minutes or until you can poke the skin with a fork. Remove from oven and let cool. De-stem the kale and tear the leaves into bite-sized pieces. Place leaves in a large salad bowl. Once squash has cooled, scoop out flesh and cut into bite-sized cubes. In a separate small bowl, combine salad dressing ingredients and whisk. Add salt and pepper to taste. Add dressing to kale and massage well with your hand to break down the toughness of the kale. Add the squash and red onion to salad bowl and mix so dressing coats the squash. Add sunflower/pumpkin seeds. Serve!